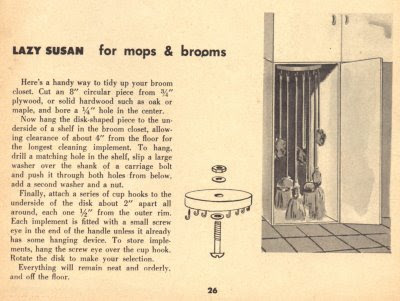 A project idea on how to store mops and brooms from the "Ask The Family Handyman" column in The Family Handyman (March 1956). I'm guessing more modern cleaning supplies such as Swiffers etc., still have holes for hanging -- and if you don't have the proper cupboard, this would work in a pantry or hall closet too. I so need this and although it is , for me, from the future (1956) as I am currently living in 1955 as a housewife, I am still going to make it. Nice blog.